premier mobile car valeting service across the New Forest - from Lymington to Christchurch. Operating from our Lymington base, we cover the entire New Forest region - visiting clients on either a regular or one-off basis as required. Our Lymington mobile valeting team will visit you at your home, office - or wherever you require - in locations including Keyhaven, Milford-on-Sea, Everton, Hordle, New Milton, Hinton, Highcliffe and Christchurch. Click here for mobile car valeting in Poole & Bournemouth. Our objective is to keep your vehicle in pristine condition, be it new or old. Our friendly staff take personal pride in their work while acting with discretion and consideration. All staff are fully-trained, smart, uniformed and highly professional. Additionally, all Autogleam's staff, fleet of vans, equipment and cleaning products are fully-insured for your total peace of mind. Autogleam's state-of-the-art vans are fully-equipped with the latest valeting technologies and are totally self-sufficient with their own water and power supplies on board, offering You, the customer, minimum disruption. We also offer specialised Marine Valeting & Boat Cleaning services throughout Poole, Bournemouth, Lymington and the New Forest area. "For the past 20 years Autogleam has kept my cars in showroom condition. I have never been let down – every appointment has been kept. 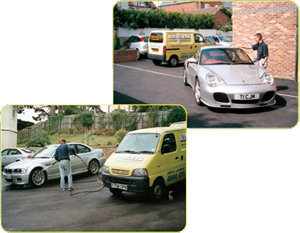 The valeting has been carried out with courtesy and great thoroughness."